Help Arrives, But South African Miners Refuse To Be Rescued : The Two-Way An unknown number of men remain below ground. They're resisting rescue because they don't want to be arrested, as 22 of their colleagues were after being rescued. The men have reportedly been mining for gold illegally. 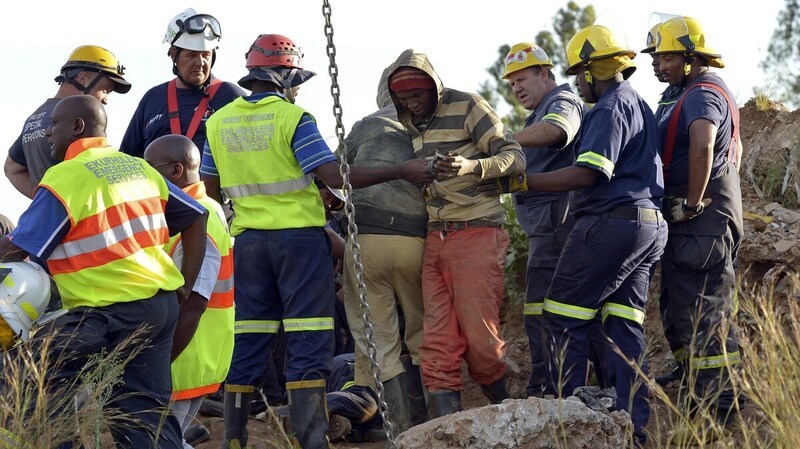 Rescuers tend to a mine worker, in striped top, after he was pulled from an illegal gold mine Sunday in Benoni, outside Johannesburg, South Africa. Many of his colleagues remain below ground for fear of being arrested. After hearing that the 22 men who have made it to safety so far were all arrested, an unknown number of other South Africans are refusing to leave the illegal gold mine where they were briefly trapped over the weekend. According to the BBC, "a full rescue operation will not restart unless the miners request it, said an emergency services official." South Africa's News 24 says that "a makeshift ladder has been left hanging from above ... for the miners to hoist themselves to safety." Security personnel are reported to be on the scene to prevent any unauthorized rescue attempts and to take into custody any miners who emerge or ask for help. "The 30 miners trapped near the top of the shaft had been able to communicate verbally with rescuers, and claimed that a further 200 or more were trapped in a lower tunnel. But Rogers Mamaila, emergency management services senior district manager in the Ekurhuleni area, told the eNews Channel Africa: 'We know of the 30 confirmed. The issue of 200, 300, is not true up to so far. However, because we are dealing with illegal mining, anything is possible.' "
Reuters notes that "illegal mining of abandoned shafts is common in the gold mines around Johannesburg, with informal miners living underground in dangerous, cramped conditions for weeks on end as they dig out small parcels of gold-bearing ore. Many are illegal migrants from Zimbabwe, Mozambique and Lesotho. Fatal accidents are common, and underground battles between rival groups have also been reported." One theory about how the men were trapped is that rival miners may have rolled boulders across the mine's entrance.